More than a PAS 128 compliant survey! Advice on project planning and scoping. Recommendations on the suitable type of survey(s) to be carried out. A desktop utility records search (This is a pre-requisite for a PAS 128 compliant survey). A range of appropriate detection techniques (These comprise of the most comprehensive suite of geophysical survey techniques in the industry). Clearly identifying the location of the utilities and anomalies identified (through geospatial referencing). Clear and accurate survey deliverables (With choice of survey reporting outputs). 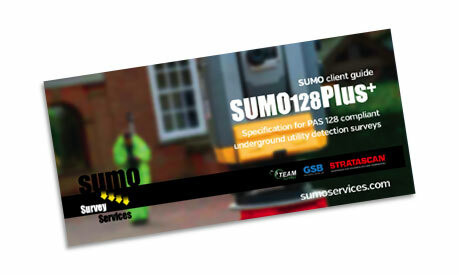 PAS 128Plus+ utilises both PAS 128 GPR methodologies and give you the ‘best of both’ survey results. This allows us to double check for more discrete utilities and identify other anomalies such as voids and foundations, which a standard PAS 128 survey won’t always find. Real time surveying… immediate indication of buried utilities marked on the ground from an EML (CAT & Genny) and GPR survey so potential problems are quickly highlighted and early decisions can be made. More utility types can be identified by tracing utilities to source. Post processing surveying… an off-site in depth office based analysis of a second GPR survey to correlate the results and check any variances from the Real Time GPR survey, as well as identifying other buried obstructions, voids, cellars, foundations and archaeological remains, if required. Topographic surveying… with levels of detail specified to suit the project needs, including a layering format for each type of below and above ground feature for simplicity and clarity.